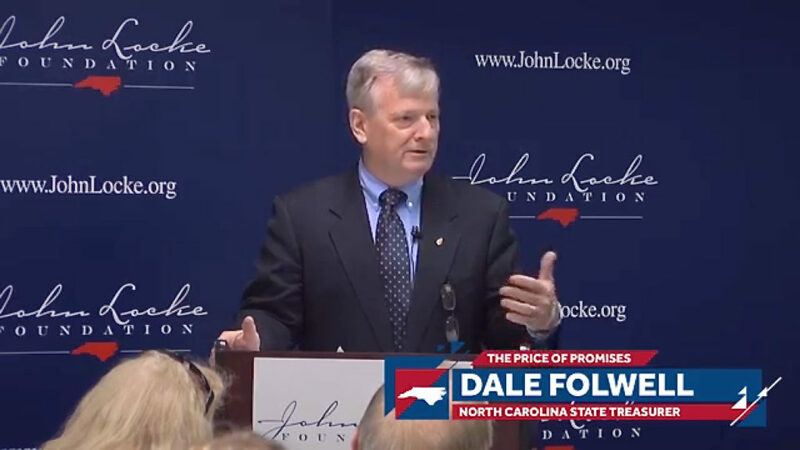 State Treasurer Dale Folwell, speaking at the John Locke Foundation in June 2017. UPDATED, May 23 at 12:25 p.m. to include comments from Rep. Kelly Hastings. A House committee has proposed a $3 billion transportation bond, but state Treasurer Dale Folwell urges lawmakers to put the massive borrowing to a voter referendum if they proceed. “I’m not against more money for transportation, nor am I opposed to the goals of those who support the proposed bonds,” Folwell said Monday, May 21, in a written statement. In addition to voter approval, Folwell said all expenditures of the bond proceeds must adhere to the Strategic Transportation Investment Process, and all borrowing must comply with the state’s debt affordability limits. The House Select Committee on Strategic Transportation Planning and Long Term Funding Solutions on April 26 prepared draft legislation, the Build NC Bond Act. Rep. Kelly Hastings, R-Gaston, chairman of the House Transportation Committee, told Carolina Journal in an email he wasn’t sure if the bill would be introduced, and if it were, who would sponsor it. “As you are probably aware, I asked a question about the full faith and credit issue in committee. As a conservative, I share Treasurer Folwell’s concerns about debt. I’m also supportive of improved and efficient transportation and infrastructure systems,” Hastings said. Under the draft bill, voters wouldn’t have a direct say over the bond. The state would have 10 years to issue the $3 billion in debt, and no more than $300 million could be issued in any year, beginning in 2019-20. Money from the state Highway Trust Fund would repay the debt. Joe Coletti, senior fellow at the John Locke Foundation who researches fiscal and tax policy, said the Highway Trust Fund has a debt capacity of about $2.4 billion over the next few years. It collects about $1.5 billion annually, mostly from the car sales tax, known officially as the highway use tax. The motor fuel tax and vehicle title fees also pump money into the fund. The state treasurer would have to approve any bonds before they were issued. Also, the treasurer would consult with lawmakers on the transportation committees six months before they were issued. The money couldn’t be spent on non-highway projects or toll projects. Some conservative lawmakers don’t want to add new state debt. They balked in 2016 at approving the multifaceted, $2 billion Connect NC bond. Others claimed voters support bonds to build roads and bridges, but the McCrory administration misled them into believing the Connect NC bond would do that. Critics tried to shift bond funding — which paid for higher education capital projects — to highway construction, but failed. The proposal for new debt follows a call in Gov. Roy Cooper’s 2018-19 budget for $1.9 billion in school construction bonds. The governor’s budget also includes the $3 billion in new transportation debt. If the Build NC Bond Act passes along with the school construction bonds, the combined state debt would more than double, Folwell said. That includes $1.8 billion in voter-approved Connect NC bonds not yet issued. How much debt a state carries, and its ability to make payments, affects its rating from national bond agencies. A better bond rating means lower interest rates on borrowing, costing state taxpayers less. The N.C. Department of State Treasurer’s State and Local Government Finance Division handles the sale and delivery of all state and local debt, and monitors repayment.